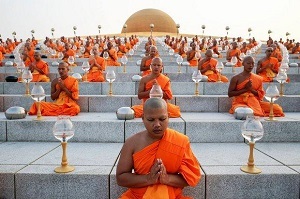 Bangkok, Thailand -- The National Office of Buddhism (NOB) is attempting to encourage Phra Dhammajayo, the embattled former abbot of Wat Phra Dhammakaya, to turn himself in to officials in the money laundering case associated with the multi-billion-baht Klongchan Credit Union Cooperative embezzlement scandal. Prime Minister's Office Minister Ormsin Chivapruck, who oversees the NOB, acknowledged this Wednesday after being asked if he had assigned the NOB to negotiate with Wat Phra Dhamakaya regarding the arrest warrant issued for the monk. The NOB was trying to convince the monk to surrender to officials, in an approach designed to avoid the use of force which it is feared could harm Buddhism, said Mr Ormsin. Prime Minister Prayut Chan-o-cha, also chief of the National Council for Peace and Order (NCPO), and Deputy Prime Minister Prawit Wongsuwon have emphasised they do not want to see violence in the handling of the Dhammajayo case. Mr Ormsin said the government is exploring ways to minimise any negative impacts of the handling of the Dhammajayo case. On Tuesday, Gen Prawit chaired a meeting of the state organisations involved. After the meeting he said no plan to enforce the arrest of Phra Dhammajayo was discussed and the concerned agencies were doing their jobs. Among the organisations attending the meeting on Tuesday were the Department of Religious Affairs, the NOB and the Department of Special Investigation (DSI). Justice Minister Suwaphan Tanyuvardhana, who also attended the meeting, said the DSI was assigned as the lead agency in the handling of the money laundering case against Phra Dhammajayo. Two options adopted for implementation were to continue to encourage the monk to surrender or else the DSI would have to find other ways to bring him to face the charges. He did not specify which methods might be adopted. The monk is facing charges of colluding to launder money, money laundering and receiving stolen property. Asked if the prosecution would be unable to proceed with the indictment without Phra Dhammajayo surrendering or being detained, Mr Suwaphan simply said he believed the prosecution could continue because three out of all five suspects wanted in this case had now been detained.